An advantage of entering a photograph is that it does not need to be in season. This month John Fennell entered an autumn flowering Corunastylis fuscoviride and a late spring/early summer flowering Diuris sulpherea, Robert and Rosalie Lawrence both entered the winter flowering Diplodium robustum and the winning picture, John Badger’s Thelymitra epipactoides is an early spring flowering orchid. Sun Orchids are another popular winner of the competitions and as there was a comprehensive article written on Thelymitra epipactiodes and as some have asked “what, actually, is a sun orchid?”, it is time to answer the general question about Sun Orchids. Of all the Australian terrestrial orchids Thelymitra or Sun Orchid is the one that looks the least like an orchid as all the segments – the sepals and petals including the labellum – are very similar in appearance. They mimic the flowers of the Lilliaceae and Goodeniaceae families. Nevertheless, it is an orchid as evidenced by the column. Columns are a unique feature of orchids. They are the combination of the reproductive organs into one structure. Between the different Thelymitra species, it is the column that is often the main distinguishing feature used in identification. Because, the column is quite detailed and so important in identification, we plan to feature this in future Journals. Other general features of Thelymitra are single, non-hairy, mainly linear leaf (of course, there are always exceptions) with a single flower stem. Flowers range from being singular to having multiple flowers which come in a range of colours from yellow to pinks to blues. Despite the lack of nectar, most Thelymitra are bee pollinated but there are some that are self-pollinated. The pollinia instead of being yellow are white and it is not unusual to see the white pollen on the self-pollinating flowers. 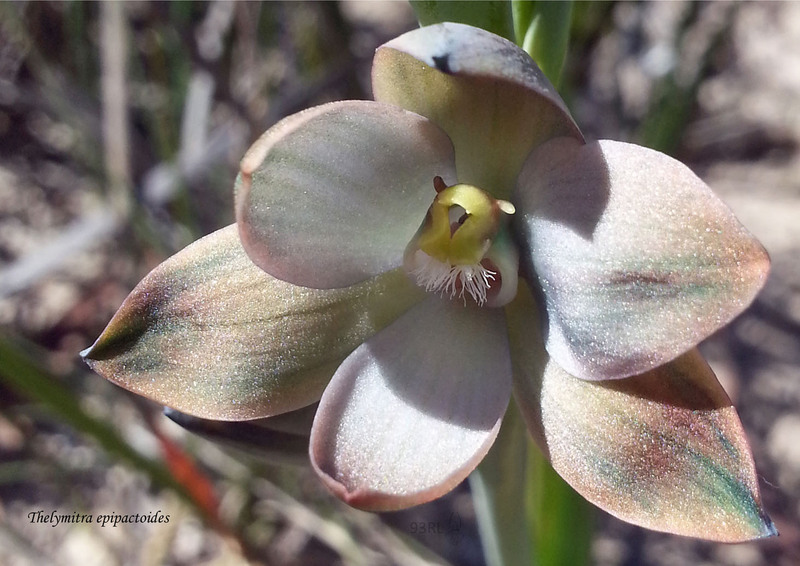 The winning picture was a single flower of Thelymitra epipactoides (Metallic Sun Orchid) taken by Rosalie Lawrence. This picture was cropped from a photograph taken on a mobile phone. Phones have come a long way since the days of Alexander Graham Bell! T. epipactoides is a special orchid both in its beautiful colourings and that it is one of our rarest orchids. This endangered species has been well studied in an effort to prevent its demise with the result that there is an abundance of information about it. Recently, with the knowledge gained, Dr Nouska Reiter of the Australian Network for Plant Conservation (ANPC) and her team have managed to cultivate 3,000 plants with the plan to re-introduce them back into the bush in the Wimmera area. (2)……can remain dormant as a tuber in the soil for up to nine years ………. (2)…….Plants can produce flowers from their second year of growth onwards for up to four consecutive years, but no more. Individual plants can remain dormant for up to two years then grow to produce flowers, but if dormant for four years or more, plants generally do not reappear. …..
(2)…… Detailed monitoring suggests that mature plants only live for about 10 years before dying (Cropper 1993). ……..
(2)……..flowers open when the relative humidity is lower than 52%, air temperature is above 15 °C, and there are clear skies …………. (1)…….Flower colour is highly variable, brown, copper, blue and green being the main colour groups which are determined by the proportion of red, blue and green epidermal cells, some of which are reflective giving a metallic appearance. ……. (1)……Population estimates vary from about 1050 plants in Australia (DEH 2006), to less than 3,000 plants (Coats et al 2002). More recent assessments suggest the population could be less than 1500 plants in the wild ……. (2)……In the Murray Darling Basin and South East Regions of South Australia there were ten populations of the Metallic Sun-orchid recorded in 2004 by Obst ……..